Is the unit plugged in? Turn the thermostat up to the next highest setting; If the unit comes on, let it run for about 30 minutes and check for cooling. Is the condenser clean and/or free of obstruction? Are the fans running and/or does the light come on inside the unit? Check the circuit breaker at the electrical panel. Plug something else into the outlet if possible, to verify if electricity is present. Call Service Company with appliance information such as Brand, Model, Serial Number, etc. Is the gas line connected to the appliance? Is the gas on/off valve in the on position? Is pilot on (if present)? Try to light pilot per factory instructions? 2. Clean Dirty Refrigeration Condenser Coils! Refrigeration Coils Should be Cleaned At Least Once a Quarter! 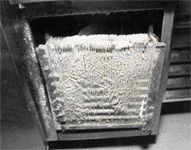 "Dirty condenser coils are the main reason for service calls." coil brush... no brooms or caustic chemicals!